Lead Flashing is strips of lead used to seal roofs. It is primarily used to waterproof joints and edges, such as when a there is an escarpment, or a corner in a roof. It is also used where chimneys or flat roofs meet walls or pitched roofing, and it’s appearance is synonymous with the architecture of traditional English buildings such as Churches, schools and stately homes. Lead is a highly malleable material and it is highly weather resistant, in fact lead flashing and lead roofing in general has a life expectancy of over 100 years. After this time the lead can develop cracks and splits, not due to deterioration in the metal, but because if the flashing is attached to less flexible material e.g. sealed in brickwork the lead cannot expand and contract freely with the exposed material. This retarded expansion and contraction in relation to the rest of the roof causes the splits. Lead is still a valuable material which makes it a target for thieves, especially as many buildings with lead flashing are both open to the public and are secluded. The government has taken steps to combat this but it is still a problem and many beautiful old buildings are being stripped of their lead. 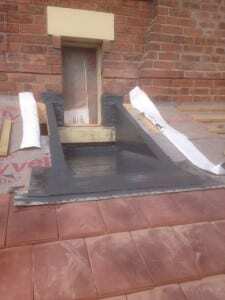 Fibreglass makes an excellent material to replace lead roof flashing as it can visually replicate lead roofing, and it is a very practical material to apply. As it is laminated on it can seal joints and corners very effectively in inaccessible areas. 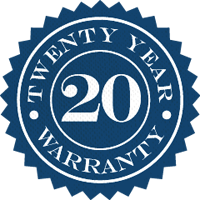 It has a lifespan of over 30 years and our installations are guaranteed for 20 years. So if your lead flashing is in need of replacement, or you have been the victim if thieves and you want a solution that is both sympathetic to the architecture of the building and practical, plus is an affordable installation, then call Ian at Merlin for a free no obligation quotation.